Paint-a-Shape panels are the first products to be introduced under the Fredrix Jr. brand. 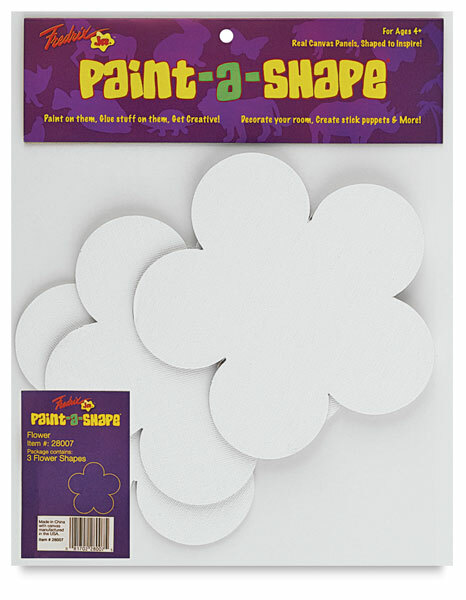 These fine-quality, two-sided canvas panels are die-cut into kids' favorite shapes, ready for decorating with paint, markers, glitter, and beads. Adorn walls, doors, refrigerators, and scrapbooks — or make stick puppets, ornaments, mobiles, and more. Fredrix, a leading manufacturer of fine-quality artist materials, has a history of promoting the arts to kids around the globe. The company has endorsed programs such as the largest cooperative painting event in the United Kingdom, featuring renowned artist Romero Britto and 1,500 children, and a "conservation awareness through art" event featuring marine life artist Wyland and 3,000 children in Beijing, China, among others. The Fredrix Jr. brand offers crafts products that inspire children to embrace the arts. Panels are sold in packages of 3 panels or in classroom packs with 25 panels of the same shape. Each panel is approximately 6” (15 cm) in diameter.